Myocardial infarction (MI) is the leading cause of morbidity and mortality worldwide. Cell-based therapies are being explored as a therapeutic option for patients with MI, among which Human Embryonic Stem Cell-Derived Cardiovascular Progenitor Cells (hESC-CVPCs) hold a great promise. During the early phase of MI, inflammatory cascade occurring acts as a driver for exacerbating and healing scar formation. However, it is unclear whether hESC-CVPCs modulate the inflammatory response when implanted at early phase of MI and whether such effect contributes to the cardiac repair. 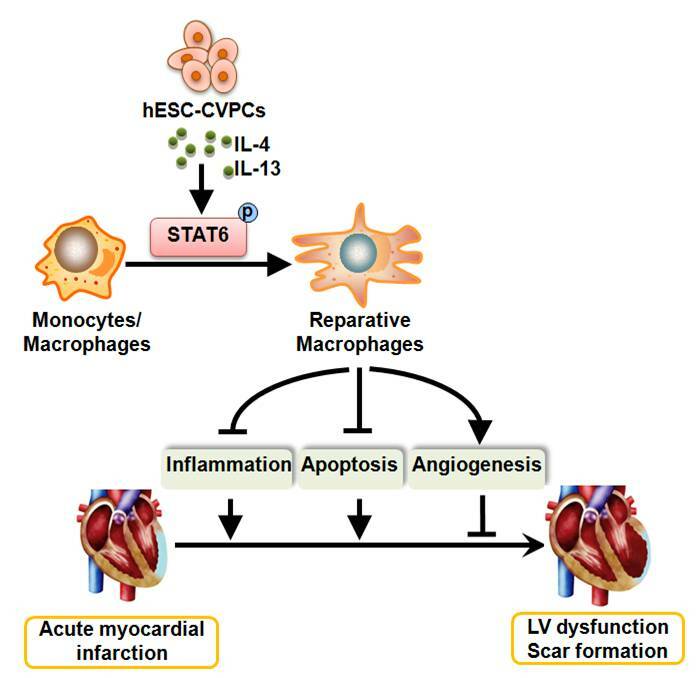 In a recent study published in Antioxidants Redox Signaling, a research team led by YANG Huangtian from Shanghai Institute of Nutrition and Health of Chinese Academy of Sciences, investigated whether hESC-CVPCs delivery into acutely infarcted hearts repairs damaged hearts through modulation of macrophage subpopulations. Researchers found that transplantation of hESC-CVPCs into the murine MI hearts significantly ameliorated the heart function and scar formation, reduced inflammatory reactions and cardiomyocyte apoptosis as well as increased vascularization. Moreover, they found that hESC-CVPCs modulated cardiac macrophages towards a reparative phenotype. This modulation was dependent on their secreted cytokines, such as IL-4 and IL-13, via activating signal transducer and activator of transcription 6 (STAT6). To identify whether STAT6 mediate the cardioprotective effects of hESC-CVPCs, the STAT6 knockout mice were used. Researchers found that STAT6 knockout exacerbated infarct injury and cancelled the cardioprotection in the modulation of macrophage polarization, amelioration of cardiac function and reduction of scar area afforded by hESC-CVPCs in the murine infarct hearts, though these mice had normal cardiac performance. The findings revealed previously unrecognized immunoregulatory roles of hESC-CVPCs on the macrophage polarization in the infarcted hearts, its importance for the infarct repair, and the underlying signaling pathway, which provides new insight into the mechanism of micro-environmental regulation of stem cell-based therapy during acute MI. The study also got supports from Prof. WANG Yigang from University of Cincinnati and Prof. Eugene CHIN from Soochow University. The study was supported by grants from the National Key R&D Program of China, the Strategic Priority Research Program of the Chinese Academy of Sciences, and National Natural Science Foundation of China.